what weight will he lift each time he walks? Palestinian children face a profound threat every single day that they live under Israeli military occupation. Soldiers, many of them only a few years away from their own boyhood and steeped in increasingly vitriolic anti-Palestinian rhetoric and deep fear of the other, patrol their neighborhoods, stand by idle or participate as extremist settlers taunt and harass the children on their way to school, and often engage with Palestinian children with ferocious violence. Israeli laws are constantly being changed to allow for the detention by armed soldiers of younger and younger children. Palestinian bodies are under constant threat. This violence is one aspect of an ongoing Nakba that Palestinians have endured for decades, a project of erasure that leaves no human being, olive tree, or square meter of land unscathed. 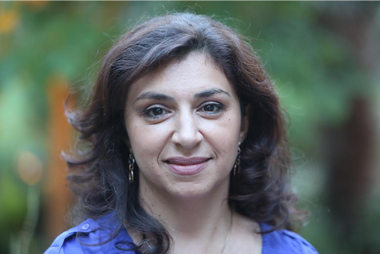 Lena Khalaf Tuffaha - is an American poet of Palestinian, Jordanian, and Syrian heritage. Lena's poems have been published or are forthcoming in journals including Lunch Ticket, Monarch, The Lake for Poetry, The Taos Journal for International Poetry and Art, James Franco Review, Mizna, Borderlands: Texas Review and Sukoon. She is a two-time Pushcart Prize nominee, for her poems "Immigrant" (2015) and "Middle Village" (2016). Several of her poems have been anthologized; most recently, her poem "Running Orders," published in Letters to Palestine: American Writers Respond to War and Occupation, by Verso Press and "Seafaring Nocturne," published in Gaza Unsilenced by Just World Books. She is an MFA candidate at Pacific Lutheran University's Rainier Writing Workshop. Her first book of poems, Water & Salt, is forthcoming from Red Hen Press.